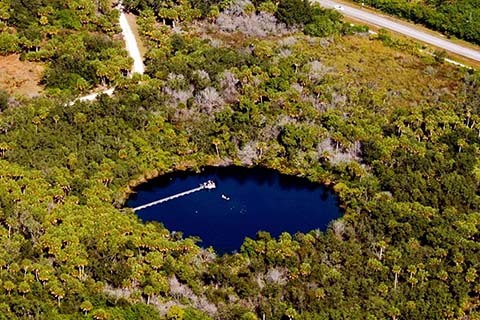 The Rosenstiel School has exclusive access to an underwater archeological and ecological preserve at Little Salt Spring, in North Port, a site located in southern Sarasota County, Florida about 10 miles (16 km) from the Gulf of Mexico. Donated to the University in 1982, the spring is surrounded by undisturbed native hydric hammock containing several rare and endangered plant and animal species. During early prehistoric times (12,000–7,000 years ago) the sinkhole was an oasis in the peninsula that attracted seasonal hunters and gatherers. The site has produced the second-oldest dated artifact ever found in the southeast United States — a sharpened wooden stake some 12,000 years old. Little Salt Spring contains some of the oldest cultural remains in the United States. The unique anoxic water that fills most of the sinkhole (below 5 meters/16 feet depth) has preserved a great range of organic materials including wood, textile fragments, hair, skin and brain tissue dating back to the Late Paleoindian and Early Archaic stages of Florida’s prehistory, ca. 9,500 – 7,000 radiocarbon years ago. Archaeological remains exist both in the spring basin and the “27 meters/90 feet ledge”, a natural cavern at that depth below the spring surface.